For me, this was the start of a long Fourth of July holiday weekend. I took Friday off of work, and wouldn't have to go back until the following Thursday. 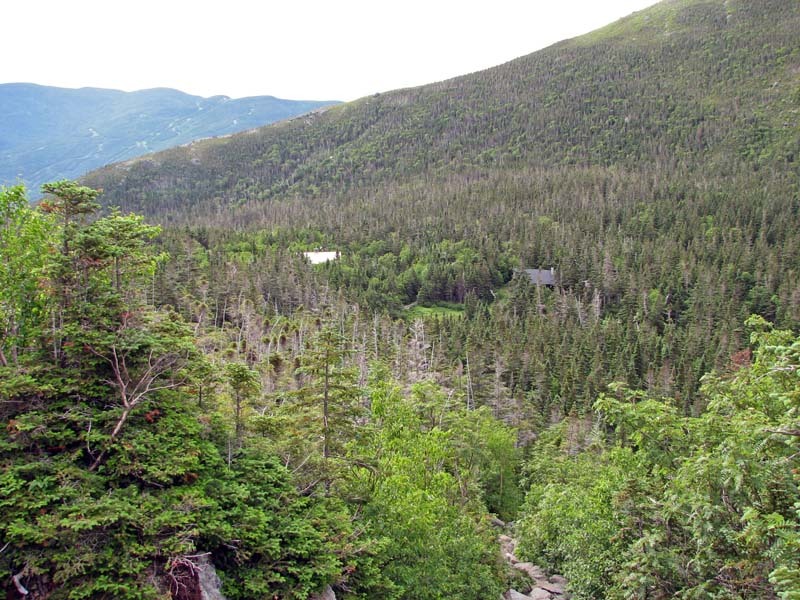 And since our family was going out on Friday evening, I drove up Thursday night and spent the night in bunkroom in Joe Dodge Lodge at Pinkham Notch so I could get an early start. In the morning, I got dressed quickly, ate a power bar, and was out on the trail by a quarter to five. I didn't have far to go to get to the trailhead, as the Tuckerman Ravine Trail begins right in back of the Visitor Center. I stopped to take pictures of the trail and ice warning signs, then started up the trail. It was a quiet early summer morning, and I even saw a fox on the trail before reaching Crystal Cascade. He probably didn't expect anyone walking around that quite that early. I was really looking forward to climbing Mt Washington from the east. 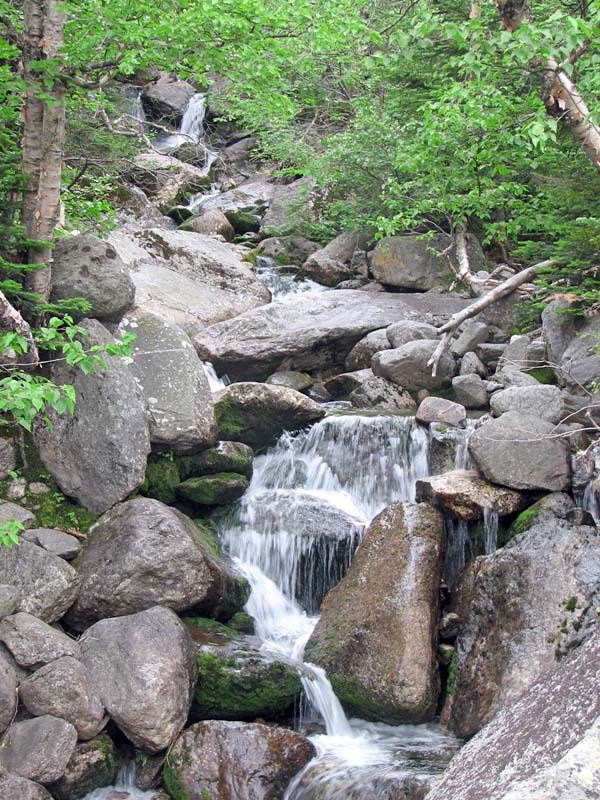 I had climbed up the western slopes on the Ammonoosuc Ravine Trail a couple of times, but had never ventured beyond Hermit Lake on the Tuckerman Ravine Trail, and that was during the winter. As expected, the trail was wide and the hiking relatively easy, considering the "moderate but relentless" climb as described in the White Mountain Guide. 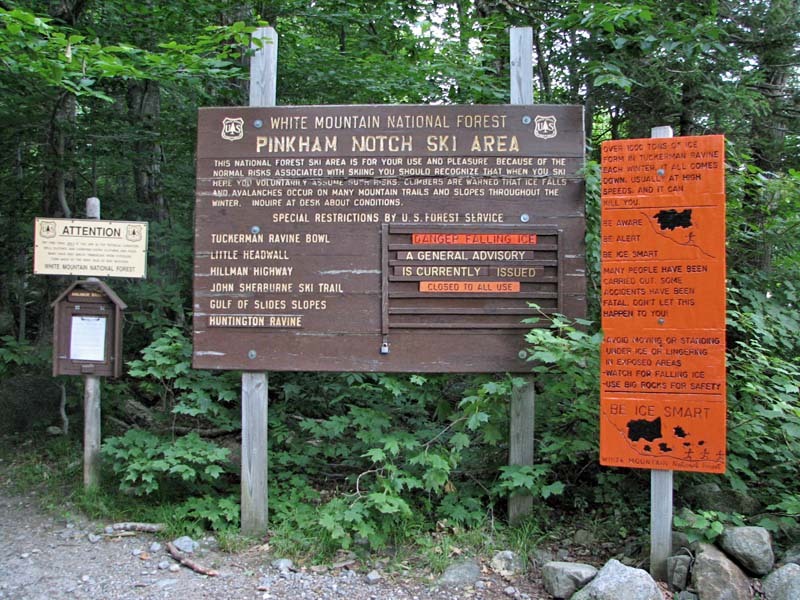 The lower part of the trail, from Pinkham Notch to Hermit Lake, is extra wide to accommodate snow tractors, which are used by snow rangers and for rescue operations. Due to its popularity, especially during the winter ice climbing and spring skiing seasons, there are quite a few rescues carried out in the ravine every year, many due to avalanches. At Hermit Lakes, I stopped in at the ranger station, which is known as HoJos, to check on their t-shirts and other souvenirs. I saw one I liked but figured I'd stop on the way down to buy it. From HoJos, there's a great view up to the ravine headwall. The headwall, known as the Bowl to skiers, is a wide horseshoe-shaped glacial cirque. It's an imposing sight, all the more so when you think about how deadly it can be. Partway up the slope beyond Hermit Lake, I stopped to admire the view back down. Besides HoJos, the Hermit Lake complex consists of the AMC Hermit Lake shelters and tent platforms, and an emergency first aid cache. Trailhead. 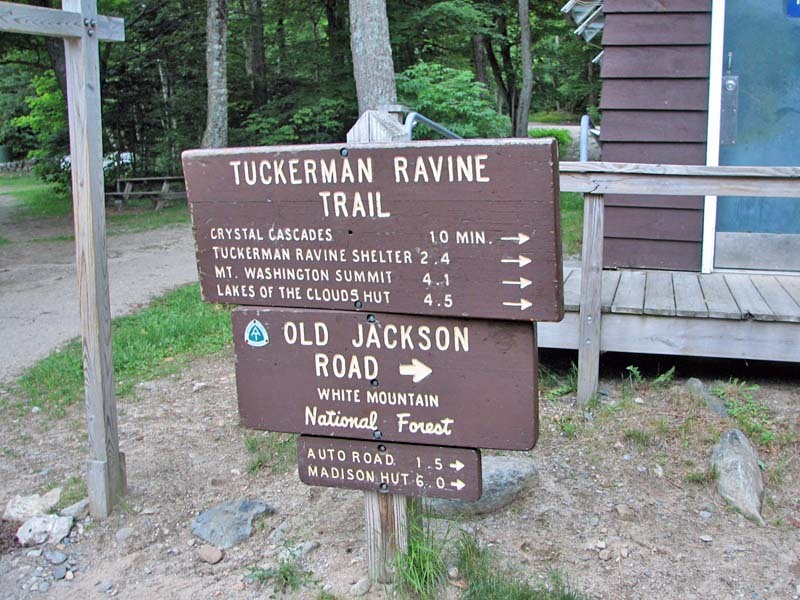 The Tuckerman Ravine Trail begins right in back of the AMC's Pinkham Notch Visitor Center. Snow and ice warning signs. During the winter, these signs serve to warn climbers and skiers about possible avalanche conditions in the ravines. 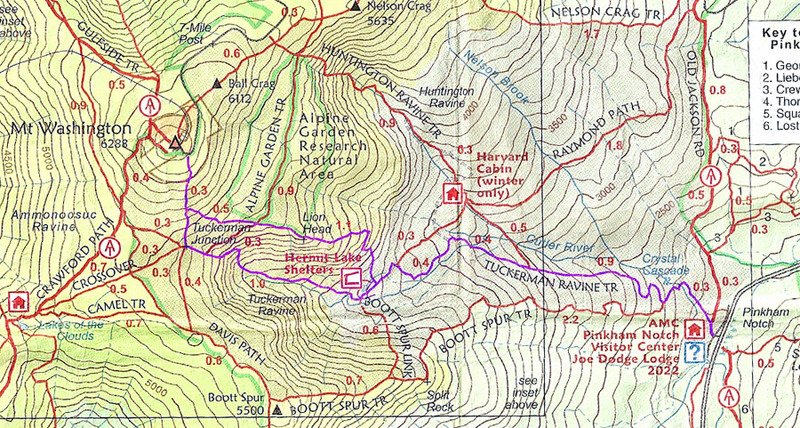 Tuckerman Ravine Trail. 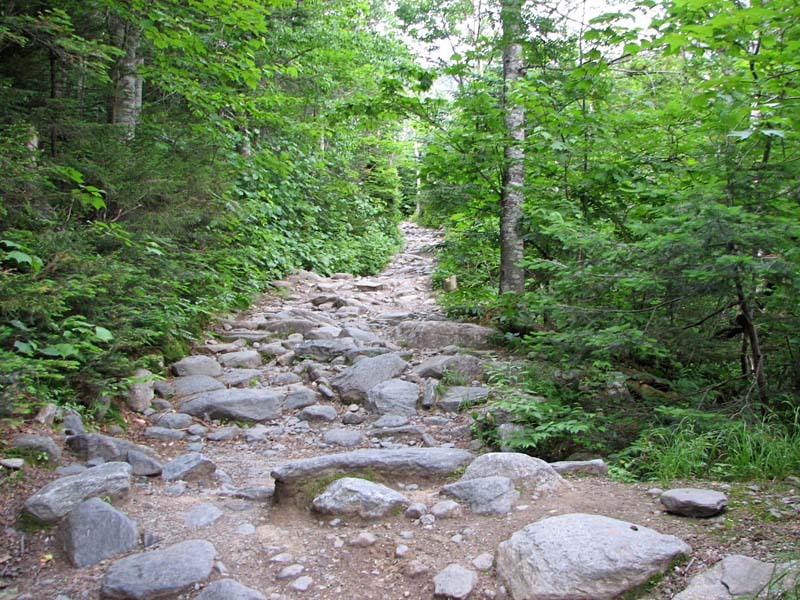 The lower part of this trail, from Pinkham Notch to Hermit Lake, is extra wide to accommodate snow tractors, which are used in rescue operations. Tuckerman Ravine from Hermit Lake. 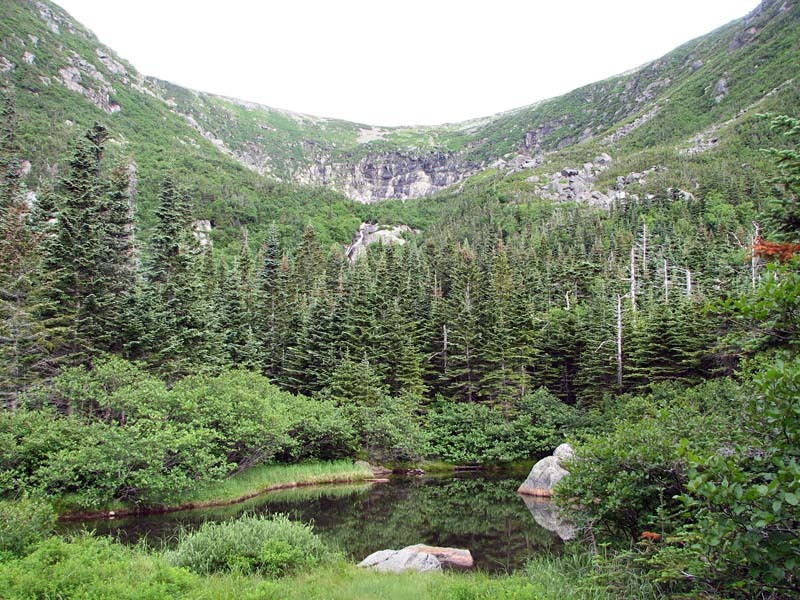 The headwall of the ravine, known as the Bowl to skiers, is a wide horseshoe-shaped glacial cirque on the east side of Mt Washington. 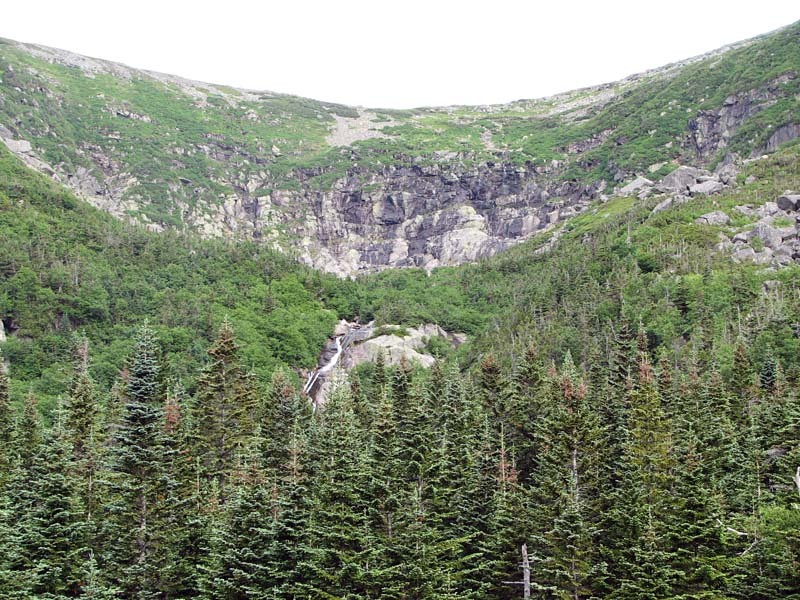 Closeup of Tuckerman Ravine. The trail begins to ascend the headwall to the right of center, then switchbacks toward the middle again. Looking back down at Hermit Lake. Hermit Lakes consists of a ranger station known as HoJos, the AMC's hiker shelters and tent platforms, and a first aid cache.